I hope you have had a wonderful Christmas Eve Eve. So it's now pretty much Winter even though the temperature is on the rise again; I haven't even been wearing coats for the past couple of days I've been so hot! It's absolute madness. 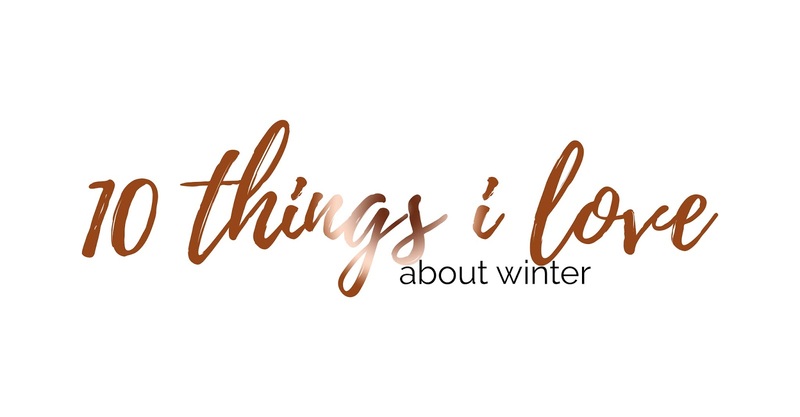 However, we all love to nose about what people like and dislike so why not create a whole post about things I absolutely love about Winter, right? Whenever I am asked what season I love the most, I always find it hard to decide but I always result to Spring and Autumn; it's not too hot, it's not to cold and you'll still find a warm or cold day throughout both. But then Summer and Winter also have their perks. If you want a day in the sun at the beach then Summer is perfect, but I do love a snow day and I'm dieing for more to come. What's your favourite season? So now that we're completely off topic, here's 10 reasons why I love Winter! Can Winter be Winter without snow? hm unless you're in the UK yes! But it is exciting when it does fall eventually. I LOVE the extremely cold days when I have to pile on the layers just to keep warm. Cosy or uncomfortable? A bit of both but it makes winter, winter! 3. Wrapping up in piles of blankets. What more do you want than being able to cosy in bed or on the sofa in a pile of blankets? Who knows. 4. Being able to wear a different coat/scarf and pair of gloves everyday. A girl may love matching bag and shoes but I'm a coat and scarf kind of girl. 13 coats and counting and god knows how many scarves! 5. Hot chocolates and hot drinks all day. I tend not to drink hot drinks throughout the whole day any time of the year apart from Winter. So I cherish the three months when I do. 6. Going to bed earlier to get cosy. I always go to bed early anyway because it's where I feel most comfortable but of course winter makes it a good excuse to go to bed that little bit earlier than usual. There's nothing better than standing in a shower for longer than usual just for how warm it is compared to the rest of the house. 8. long and cold (yet cosy) walks. I am a huge fan of long walks in the evening when it's dark and although Winter is freezing, wrapping up in thick coats, scarves and bobble hats brings me a lot of joy. 9. It's dark in the morning. I'm not a fan of the sky getting dark really early at night, it drives me mad sometimes because it means there's only a certain amount of hours in the day to get things done with daylight. But I do love a crispy and dark morning. 10. It's generally just more cosy. As I love creating lists, this was the perfect post to do; but generally everything about winter is so much cosier than any other month. YES TO FRICKIN HOT SHOWERS THE BEST THING EVER!!! I hope you have an amazing Christmas ahead of you!